How It’s New York: The Mickey Finns are a New York-based band; they list their hometown as “NYC” on their facebook page. How It’s Irish: They played Irish rock, and Ray Kelly was from Clare. We’re shocked and saddened to hear of the sudden death of Ray Kelly, lead singer of The Mickey Finns, and one of the founding members of The Prodigals. Facebook has lit up with musicians and friends expressing grief and condolences, on The Mickey Finns’ page and on their own. He is survived by his family, who are according to Murph Guide.com, his wife and son Jude, his son, Robert, and daughter, Rachel. We also share sympathy with his bandmates, fiddler Matt Mancuso, drummer Brian Tracey, and multi-instrumentalist Eric Kaye. The core of the band has remained the same. Singer/Guitarist, Ray Kelly, hails from Co. Clare and his whiskey soaked voice is the trademark of The Mickey Finns sound. 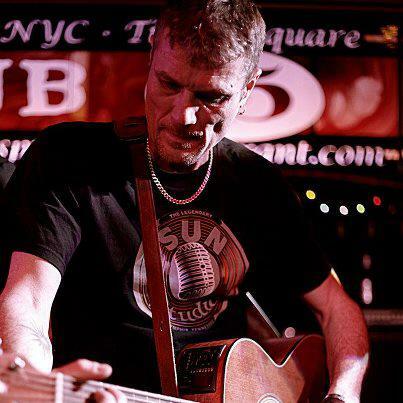 Kelly was one of the original members of the “jig punk” band, The Prodigals, recording two albums with them and helped usher in a new era in Celtic Rock sound. His song, “Tanks and Barbed Wire”, about the struggles in Northern Ireland has become a staple on Celtic Rock radio and remains a fan favorite at live shows. He will be sorely missed; Condolences to the Kelly family during this tragic time. Ray was truly one of a kind. Witty, creative, wild, warm, generous and most of all a kind hearted soul behind a mischievous grin. Our thoughts and prayers are with the Kelly family and all those who were fortunate enough to have been entertained by Ray. On behalf of The Highland Rovers Band, we will miss you terribly. Thanks for all the fun times you shared on stage with us and the after hours antics in your pub. Ray was a more than just a fine musician, he was a Clare man true & true. I remeber the first day my fiancee and I met him and he answered our “Up the Banner” cry. We enjoyed our talks of the days when he was deliverin’ the post or workin as a butcher back home on the isle. We raise a glass of Powers to you Ray. You were a fine lad and will be missed.